Cyprus property prices fell at a slower pace during the second quarter of 2010 with Cypriot buyers starting to return to the market according to the recently published RICS Cyprus property price index. THIS is the third publication of RICS Cyprus’ Property Price Index, a quarterly price and rental index which is based on methodology produced by the University of Reading, UK. The Index tracks property and rental prices across all districts and main property types. During the first half of 2010 Cyprus bore the brunt of the global economic crisis, with the economy slowing down and the government’s income decreasing. There was a significant reduction in property transactions, particularly from overseas buyers whose local economies, e.g. the UK and Russia, continued to suffer from the economic slowdown. Towards the end of the second quarter, there were some early signs of stabilisation, with local buyers returning to the market taking advantage of lower prices for holiday homes. Also, some landmark projects received planning permission (Tersefanou Golf Course) or started construction (Limassol Marina). These early positive signs need to be viewed within the wider context of a continuing curtailing of loans by banks and other financing institutions for property purchases, and to a change in people’s expectations of future changes in capital values and holding investment as an asset class. The Property Price Index has recorded a varied behaviour in property prices across Cyprus’ major urban areas, with residential prices falling across all districts and commercial prices fluctuating. Residential prices for both houses and flats fell by an average of 2.5%, with the biggest drop for houses taking place in Paphos (-4.0%) and for flats in Paralimni (-3.3%). Values of commercial properties generally fell across all cities by an average of 0.5% for retail and 2.1% for offices. The exceptions were warehouses which rose by an average of 0.4%, greatly influenced by warehouses in Limassol which rose by 4.5%. 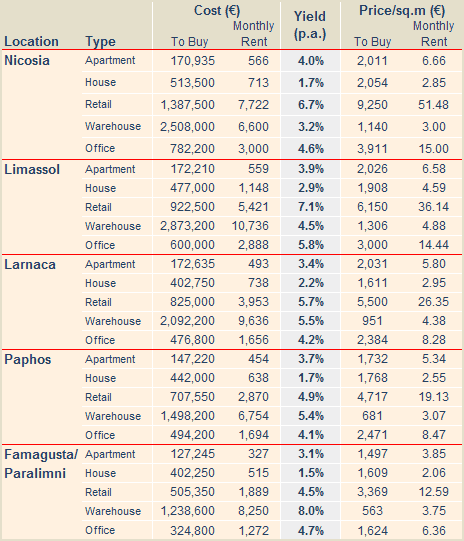 Across Cyprus, rental values for apartments rose marginally by 0.3%, whilst rents on houses, retail units, warehouses and offices fell by a respective average of 2.1%, 0.8%, 0.2%, and 2.1%. The distribution of rental changes shows an interesting dichotomy between Nicosia, which continues to be stable, and the coastal cities. Rents for all property types fell in Paphos probably indicating the continuing woes of the city. Similarly rents in Limassol, except for warehouses, also decreased; a sign that the crisis in now beginning to affect the Limassol market. Yields are a useful tool showing the relationship between rent and property prices. Initial yields on commercial property increased slightly, and now stand at 6.0% for retail, 4.7% for offices, and 4.9% for warehouses. Yields on residential property are at a very low of 3.6% for apartments and 2.0% for houses, showing that prices relative to rents remain at multiples which are considerably above that of other European countries and that there is still room for rebalancing to take place. Apartments: Residential, two bedroom, 85sqm, Medium quality. Houses: Residential, three bedroom with garden, Semi-detached, 250sqm, Medium quality. Retail: High-street retail, 100sqm ground floor area with 50sqm mezzanine. Warehouse: Light industrial area, 2.000sqm, 200sqm office space. As I recall, there are some 120,000 properties in Cyprus without Title Deeds. Not all of them have been built on mortgaged land; some do not have Deeds due to planning infringements – and it is the backlog in these that the new legislation currently under discussion is designed to speed up. Unfortunately, no one in authority will divulge the number of properties built on mortgaged land that have been sold to unsuspecting buyers, or the current balance of developers’ mortgages on that land. But there has already been cases reported in the media (including this magazine) where the banks are repossessing properties and auctioning them to recover the developers debt. I personally know of other cases in the pipeline. When exactly do you think the banks will begin to reposess the 120,000 properties? Also from where did you get this figure? Repossessions in Cyprus take years so I would be too quick off the mark with your comments of impending doom. And price will continue to fall across Cyprus. Soon the banks will start to repossess the houses from the 120,000 expats and there will be a glut on the market all at the same time. The best bet is to wait and see what happens. When the first bank steps in it will trigger a response as the rest will not want to be left behind. An additional 120,000 houses will become vacant and drive down prices.